We were very sad to find out that my step son is allergic to EVERYTHING. Well... not quite everything, but a good number of things. He is allergic to wheat, corn, tomatoes, peanuts, walnuts, sesame and soy. He is also allergic to most grasses, pollen and trees. We have an annual tradition of going camping every Summer. This year we decided to go back to Lake Wenatchee State Park. And part of this tradition is that I make cookies for camping. My mother always made a batch of cookies for our camping trips growing up. When I got older, she passed baking cookies on to me. I was really upset that I wouldn't be able to make him cookies, but then I picked up some gluten-free flour and decided to give it a try. Wow!!! These were awesome! Perhaps some of my best cookies EVAH! They are super moist and yummy. The kiddo loved them too! What a wonderful treat for a kid who's allergic to everything yummy to a kid. 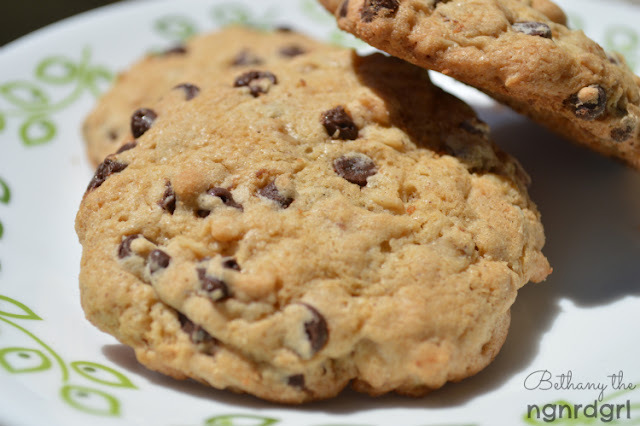 I started off with the Toll House Chocolate Chip Cookie recipe. 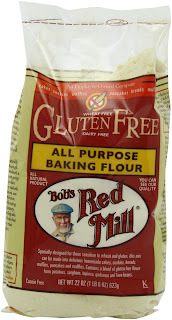 Substituted wheat flour with Bob's Red Mill All-Purpose Gluten-Free Baking Flour (affiliate link). 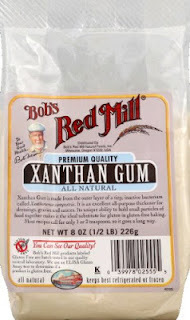 When using gluten free flours, you need to add Xanthan Gum (affiliate link) in order to help the flour bind. I also found some gluten, dairy, nut and soy free Chocolate Chips by Enjoy Life (affiliate link) that are processed in an allergy free plant. The Toll House chips have soy lecithin in them, making them not good for the kiddo. Most are also made in a facility that may have also processed nuts. And if your kid is allergic to dairy or if you are vegan, then the normal chocolate chips are ruled out. Since he can't eat walnuts, I decided to add oatmeal. I love the texture that oatmeal brings to cookies. Chocolate chip oatmeal cookies are my favorite! 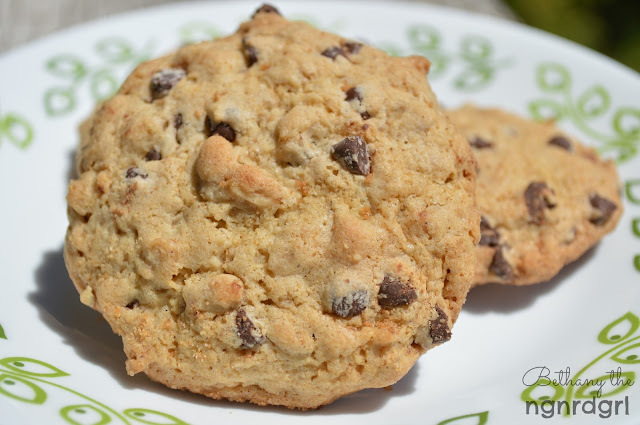 Super yummy, moist, chocolate chip oatmeal cookies. Plus they are Gluten-free and you would never guess it! Combine flour, xanthan gum, baking soda, salt and cinnamon in small bowl. Beat butter, granulated sugar and brown sugar in large mixer bowl until creamy. Stir in chips and oatmeal. Disclaimer: Affiliate links are provided for recommended products. I was not compensated for this article. All opinions are my own. mmm...those look great--we'll have to try them! They are really yummy! You should! 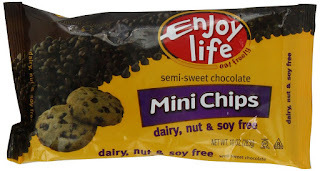 they look yummy -we love the enjoy life choc chips! They are very yummy. I seriously think the are competing for best cookies I have ever made! These look awesome! One of my good friends has to have all Gluten-free, so I will certainly have to try these! Thank you! They are fantastic! They seriously compete with normal cookies. Also, thanks for the invite! I've linked up. Yum, these look great! Pinning! Thank you! They are wonderful. Stopping by from the Pin Me Linky Party over at Diana Rambles. I am one of the cohosts this week. Just wanted to thank you for posting. I'm so excited you shared this. I have been gluten free for the last 6 weeks and it has been hard. I am all ready not happy about not doing my traditional chocolate chip cookie recipe at Christmas. These cookies look amazing and like you'd never even know that they are gf and allergy friendly. I'm pinning and will be trying. These look great! There's a new Link-up party going on at One Sharendipity Place this weekend and we'd love to have you join us! Here's the link! Thanks for the invite! I've linked up. I love this and can't wait to try it! 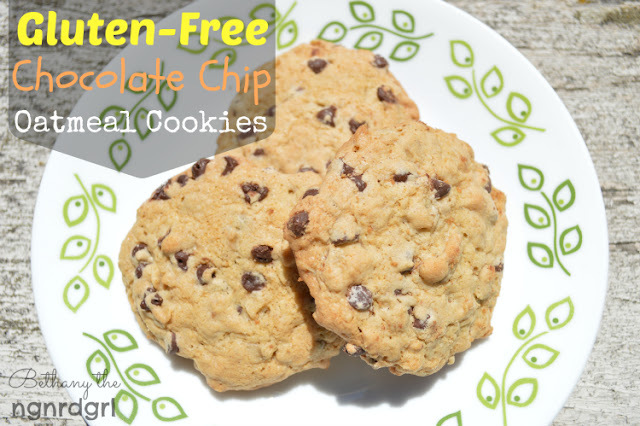 I have had to go gluten-free almost 2 years ago and these look amazing! You have to try them! They are divine. I'm not kidding when I say they are in competition with my normal cookies for best cookie EVAH! Thank you for pinning it!